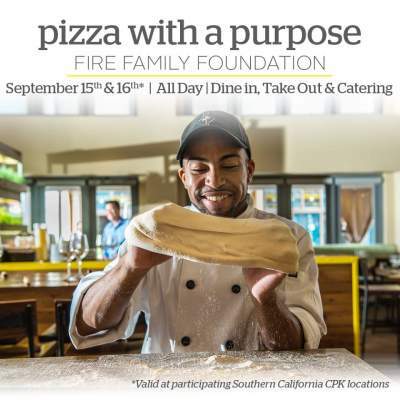 California Pizza Kitchen (CPK), the authority in creative dining with a California vibe, will host a two-day FUNdraiser at all of its Southern California locations to benefit Fire Family Foundation, which supports injured and ill California firefighters and their families. From Sept. 15-16, CPK will donate twenty percent of net sales (dine in, takeout, beverages, catering) across its 44 Southern California locations to the nonprofit organization. To support the Fire Family Foundation, CPK guests must present this flyer to their server. WHO: California Pizza Kitchen: Promoting positive change and doing good in the communities it serves is part of CPK’s DNA. In 1985, CPK opened its first restaurant in Beverly Hills and introduced diners to innovative California-style pizza. Since then, CPK has launched what has become a global brand known for creative California cuisine. Today, CPK is approaching 300 restaurants in 15 countries and 217 cities around the world and has served over 15 million pizzas to more than 43 million guests. 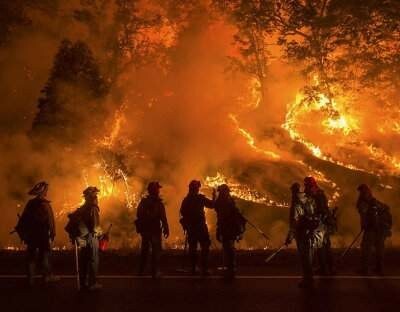 Fire Family Foundation: A nonprofit founded by the respected Firefighters First Credit Union, Fire Family Foundation offers immediate assistance to firefighters and their families, fire victims, fire departments, and charities. The Foundation believes that by coming together as a “Fire Family,” assistance can be provided to those impacted by fire. CPK is located in Santa Ana at 2800 N. Main Street, #872, in the upper level of the MainPlace Mall, next to Nordstrom.